Exposure Triangle Explained for Beginners : How Aperture, Shutter Speed and ISO Works Together. 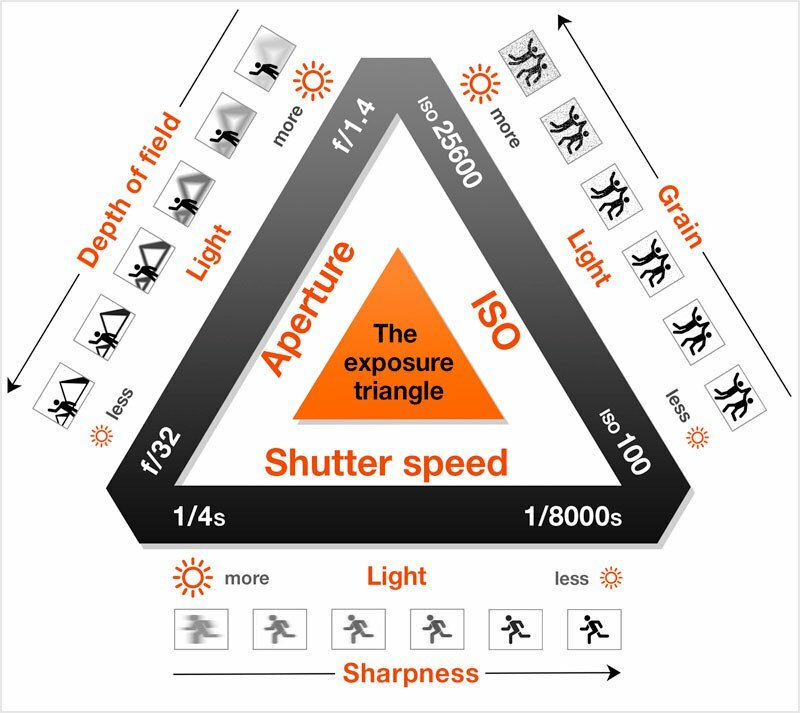 The most common standard term used to define how Aperture, ISO and Shutter speed are related, is known as Exposure triangle. One must balance all these 3 factors to get the desired result with properly exposed image. All 3 terms are inter-related to each other and changing value for one might affect other as well. In my last blog I explained what Aperture, shutter speed and ISO. Those 3 blogs are independent of each other so here will see how all three are connected. Exposure for photographs refers to the term on how image is recorded by sensor, it signifies the amount of light which is captured and on this basis how the final picture will come up. Shutter Speed: The amount of time shutter is open. Here you can see slower shutter like 1/4s speed will blur the moving subject but it allows more light to reach the sensor. Similar, Fast shutter like 1/8000s speed will take the sharp picture but due to fast shutter less light reaches to sensor. Aperture : This is the size of lens opening which control amount of light reaches sensor. A small aperture (big f number like f/32) will take the super sharp picture of subject including background and foreground. But due to small aperture it allows less light to reach sensor. On the other hand big aperture (small f number like f/1.4) will blur the background while foreground would be super sharp. ISO : This Measures the camera’s sensor sensitivity to light. Here less ISO like 100 will take sharp picture with no noise. Less ISO means sensor will be less sensitive to light. While the high ISO like 25600 will introduce too much grain in picture and sensor would be very sensitive to light. 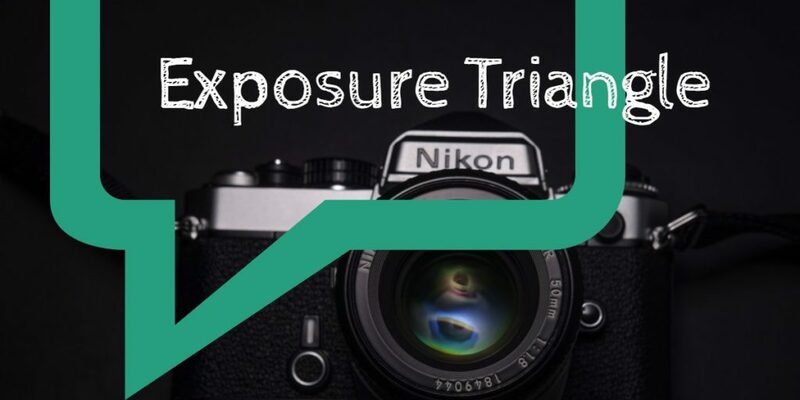 With the help of this small story, I am trying to explain the scenario and how/when to control all three different aspects of Exposure Triangle ……. I was on a trip to my favorite place on the planet to take pictures. I was being informed that the triple-horned rhino in the park are extremely rare , so I worked hard that week to capture images of the last few rhino left in that area of the park. Around 9AM on a cloudy day, I found a small group of triple-horned rhino and started photographing them with a long 300mm Tamron lens. The early hour and clouded sky made the situation quite dark for shooting. To compensate this darkness, I had to keep my camera setting with maximum aperture, my lens had a maximum aperture size of f/4. So I set my aperture to f/4 to gather as much light as possible. This will also impact the depth-of field (blur effect) to blur out the stones behind the triple-horned rhino. This makes the perfect Rhino shot with subject shapely in focus and everything else is beautifully blurred. Next, I had to set my shutter speed. I wanted to capture action in the photo, So that’s why I needed shutter to open for a fraction of second so that images should not come out blurred, so I set my camera to 1/500th of a second. I knew that fast shutter speed would prevent any motion blur from the rhino running on a grass side. And then, I fired my shutter and picture got displayed on LCD. Sadly 🙁 picture was way too dark and I could hardly see Rohino on my LCD. Here I couldn’t compromise my shutter speed or aperture, so I knew I needed to use the third player in the exposure triangle–the ISO. I started played around with ISO, when we increase ISO, sensor becomes more sensitive to light and it gathers more light from environment than it generally does with low ISO, but with too much ISO it will also show graininess in picture. So I had to manage something in between so that picture should be bright enough with less noise. And finally found that if I increased it to ISO 640, it made the picture bright enough without making it overly grainy. Yehhhhh ! This combination of shutter speed, aperture, and ISO worked out perfectly. Now you can see why we need to control shutter, aperture, AND ISO to make photograph perfectly exposed to light. It shouldn’t be blown out with too much light or underexposed with less light. This was just a simple story to tell you about how everything is related in camera when it comes to exposure, so that you can start this wonderful journey of photography. Hopefully now you know how Aperture, Shutter Speed and ISO Works Together to get correct exposure. Do let me know your doubts.. I will surely answer those. Steps and explanation makes one who is interested in better photography to learn and this is very clearly explained and illustrated about all stuff. This helps any amateur photographer to practice professional photography technically. Thanks for sharing this blogs….. Thanks Zabeer for your kind feedback. I would be happy if you share my site with your friends who have just started photography. When using manual mode, I wanted to know that irrespective of the situations which one do you choose to set first? Thanks for your comment. To your question, there is no such standard that you need to set you aperture first then shutter speed or ISO. It depends on what you are shooing in which condition. Suppose you are shooting a landscape in a cloudy condition. Here the first thing you need to take care of Aperture, you can not open your lens to f/1.8 or f/1.2 to get maximum light, if you do this you will not get everything in focus. For landscape you have to use f/16.0 or f/10.0 to get everything in focus. At this aperture lens doesn’t allow much light to reach to sensor. So now, to compensate you have set your shutter speed, if you have a tripod then you can afford to slow down shutter below 1/60 to get enough light but if you are shooting handheld then 1/60 is the lowest shutter speed one can shoot, below this camera can shake. Now click picture, if image is ok that well n good, if its still dark then you need to use 3rd pillar which is ISO. You can increase ISO by 400 or 500 to keep shot clear n sharp enough without introducing much noise. So basically, it all depends on situation. Anything you an set first and then play with other two aspect accordingly. I am having Nikon d5300 with kit lens and planning to buy a prime. But i am in a big confusion whether to go for 35mm or 50mm because they both costs same amount. Right Prajwal, Both costs almost same. I also had same confusion a year back. If you are more into portrait photography then you should go for 50mm. The reason is obviously its focal length, its not very wide and keeps the subject really tight in a frame with lovely bokeh effect. In crop sensor camera it would work on focal length of 75mm (50+50*1/2). 35mm is all-rounder lens I feel, you can take lovely portraits if you get close enough to subject, and also at the same time you get enough wide angle to shoot street photography as well. 35mm is almost equivalent to what human eye sees, so its more natural. This lens is great for street photography or even for landscapes. I opted for 35mm, you can check picture on my Instagram account.